During the last ten years of economic mirth a lot has changed in regards to the contemporary city, both in how it looks and how we inhabit it. Since the late 1990’s both cities and private capital have invested heavily in glamorous architecture and staggeringly beautiful landscape projects whose role it was to enhance a particular metropolises cultural cache in relationship to its global neighbors. Technological innovations in consumer electronics coupled with the increasing prevalence of the Internet have enhanced cosmopolitanism and network culture rather than creating isolation that early critics feared. And while the money poured in aesthetic beauty and civic narcissism reigned supreme. Now, as capital flows across global markets evaporate and those markets begin to collapse, politicians and civic pundits alike are all whispering the same word: Infrastructure. While a new museum or concert hall will be a hard sell over the next decade they theorize, a new bridge or light rail project will not because of the construction jobs those projects generate. Even President-elect Barack Obama has stated that part of the U.S. economic recovery will hinge on heavy government spending and investment in infrastructure. As building commissions dry up it is only a matter of time before architects try to align themselves with these new State and Federal patrons, casting aside formal seduction in favor of survival. They will no doubt find that infrastructure does not need them and in fact faces a crisis of its own. It only takes a book like The Infrastructural City to make this apparent. Edited by network theorist Kazys Varnelis, the book’s authors seek to clarify the role of infrastructure in shaping the contemporary metropolitan environment as well as illuminate its inherent weaknesses. Focused on Los Angeles, Varnelis and his writers slowly pick away at the popular misconception among architects that what they produce in urban environments actually affects the way in which cities perform. Loosely riffing on Rayner Banham’s original thesis in the Architecture of Four Ecologies, the book examines urban constructs such as flood control channels, telecommunication networks, and commercial logistics centers and how their location and physical manifestation shape the city in profound ways that a patron-based civic project such as Frank Gehry’s Walt Disney Concert Hall never could. Varnelis is adept at corralling an eclectic mix of writers (many of them practicing architects), photographs, and diagrams, and bonding them together into a seamless trajectory of critical observations about Los Angeles and its surrounding environs. With the exception of One Wilshire, a “telco-hotel” in Downtown Los Angeles originally designed by Skidmore Owings and Merrill and intended as “Class A” office space (which never happened due to the economic downturn of the 1980’s), there is no pedigreed architecture in this book. Instead, what is discussed in the superbly written essays are the behemoths of capital; the myriad of systems, networks, and technologies that make cities work. A majority of the writing in the book will satisfy both the casual reader and academic alike. However, in his introduction Varnelis suggests that the book might serve less as a text for the classroom and more as a guide for the intrepid urban explorer: someone filled with an unquenchable desire to understand the metropolis that surrounds them and strikes out onto its freeways and river beds searching for enlightenment. After reading The Infrastructural City, I agree with this projection, and see the book as a contemporary to the Thomas Guide, that incredibly detailed and thorough six hundred-plus page map book that every new arrival to Los Angeles used to buy before GPS technology rendered it obsolete. The beauty of the Thomas Guide was its informational density. It permitted the user to gain a personalized reading of Los Angeles by allowing them to abstract the various symbols and strains of data into their own “meta-code” of navigation. However, don’t be fooled into thinking this is simply a book for fans or scholars of Los Angeles. 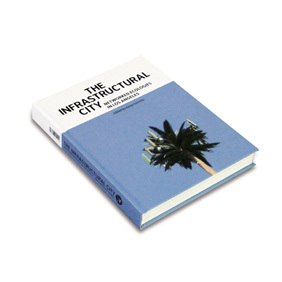 The essays in it espouse to the ideal that the various topics are relevant to the larger global perception of urbanism and that Los Angeles is merely playing the role of the provocateur in this scenario. In short, this could have taken place in New York, Hong Kong, or Dubai and the message would still be the same. Infrastructure is the dominant force that shapes the contemporary city, not architecture, but both are in crisis due to the breakdown of speculative financial markets coupled with the proliferation of NIMBYism in the modern city. What also becomes apparent after reading The Infrastructural City is how tenuous the architect’s role in contributing to the built environment really is. As capital flows increase their plasticity and are lubricated by technology, cities choke on grass-roots democracy and localized individualism, stymieing new civic projects. As a result, the role of infrastructure as a panacea for solving the problems of the contemporary metropolis only gains friction, leaving it open to terminal failure. Only by understanding and recognizing this reality will architects be able to operate in the contemporary urban terrain. As commissions continue to elude practitioners during the current global economic malaise, architects and urban planners may be left wondering where they went wrong. The Infrastructural City will help them.